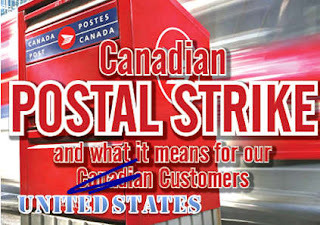 With a Canadian Postal Strike dragging on, my first question is; How much are US Internet Retailers losing because of this postal strike? Granted you can ship your products UPS or FedEx but what about all those smaller items; DVDs, jewelry, t-shirts & other low shipping cost items? Amazon, eBay, Overstock and other such websites are probably seeing a reduction in sales from the US to Canada, not to mention within Canada. So you think, UPS must be loving this. Well retailers certainly are not. It costs $23.87 to ship a 1 pound box from California to British Columbia, Canada (a 6” x 6” x 2” package with a declared cost of $40). USPS would charge anywhere from $4 to $7 depending on the exact location. 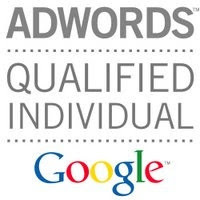 That is a 300% mark-up, what other options do we have? The USPS is running heavily in the red. CNN Money reports, “The U.S. Postal Service reported a $3.8 billion loss in the 2009 fiscal year, and plans to propose to Congress in 2010 that it drop Saturday delivery.” Well, the Post Office still delivers on Saturday. Clearly the Postal Service is not a successful company, “The Postal Service reported operating revenue of $68.1 billion, down 9% from last year, while its operating expenses fell to $71.8 billion, down 7% from 2008.” Maybe some changes need to be made? You think? Not all package delivery companies are thriving in the US, DHL, after an acquisition of AirBorne Express not only lost $10 billion in 5 years but destroyed a US town in the process. In 2008, Deutsche Post's U.S. division closed its 18 main distribution hubs and laid off most of its workers in the US, according to BusinessWeek. In the “Global Economy” even local Mom and Pop Internet retailers can get hit hard by foreign economic crisis. We have learned from recent events that the economics of the US is balanced with the world economy. 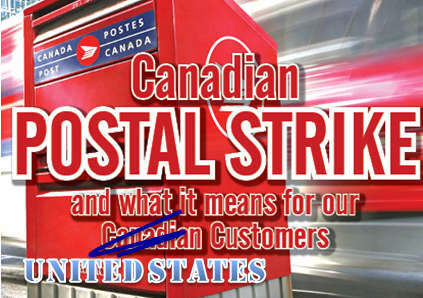 The Canadian Postal strike is sending ripples through the US economy, whether they know it or not.